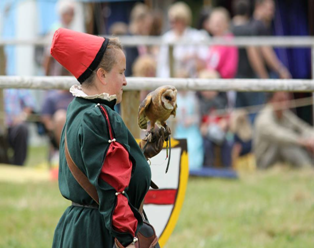 Hawking or Falconry was an expensive and extremely popular sport in medieval times. The birds were a substantial investment that made it a sport for the rich only. The care, feeding and training of the birds was also expensive. Special rooms (mews) were often built to house the birds and on occasion the birds would share the falconer’s rooms. The birds would rest on perches with jesses (leather or silk) attached to their feet via a varvel (swivel) and leash, which was tied by a falconer’s knot to a ring on the perch. A hood was placed over the head of the bird (hoodwinked) to keep it calm. When the bird was being carried on the hand, a thick leather glove was worn to protect the hands from the bird’s talons. Falcons were trained for hunting on the wing, their prey being birds. The Hawks would fly from the fist, their prey being hares and rabbits etc. This would be carried out either on foot or horseback. The sight of a falconer with a bird on his hand on horseback would have been a great sight. 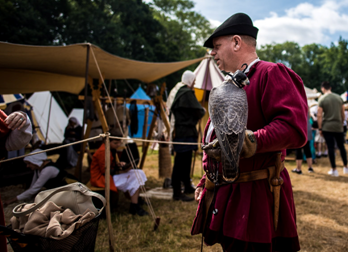 There were severe penalties associated with Falconry. A fine of £10 (a country labourers wage for nearly two years) was imposed on anyone who took any hawk or drove it from its nest. For taking hawks eggs, the penalty was imprisonment for a year and a day and a fine at the King’s will. 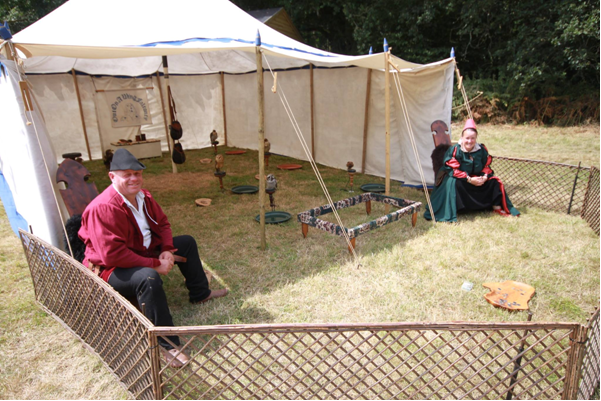 What you will see at Ancient Oak Medieval Fayre is Falconry at it best. Marvel at the birds as they perform spectacular feats in front of your eyes. See the Falcon stoop from several hundred feet and try to catch the lure, watch the Kite twist and turn on a sixpence and try to hear the silent flight of the Owl. Marvel at the Regal Eagle in his splendour. 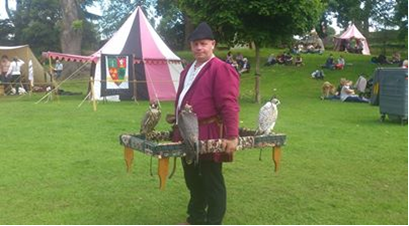 Come to the medieval market, where you can talk to the Falconers and see the birds in their Mews.